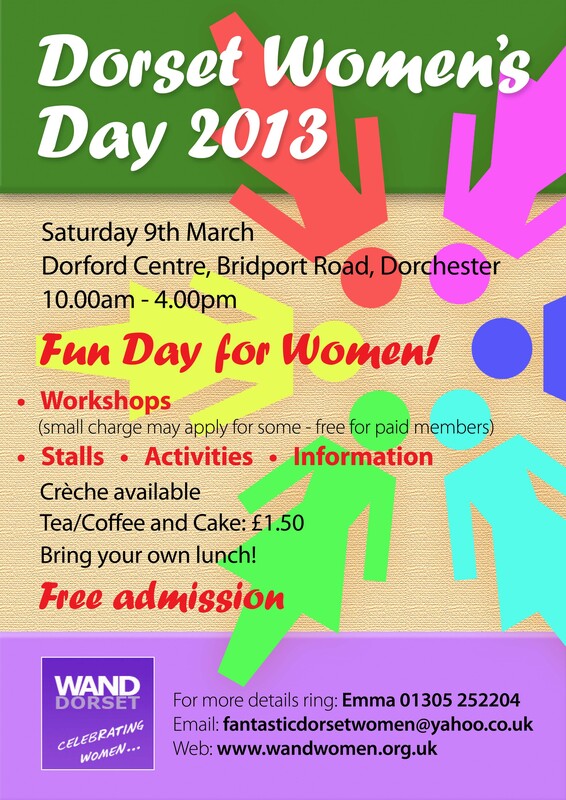 This year’s Women’s Day will take place on Saturday March 9th 2013 from 10AM – 4PM Dorford Centre Dorchester. The event celebrates International Woman’s Day this year being celebrated on 8th March. Admission to this event is free and is open to women of all ages and backgrounds. Free crèche facilities will be available together with the opportunity to purchase delicious home-made cakes and refreshments lovingly prepared by WAND volunteers. House of Colour – presented by Vicky Gray – a welcome return to a WAND favourite! New this year will be THE RUMMAGE ROOM – an opportunity for people to donate any unwanted women’s clothes, accessorises and books (all clean and in good condition) and pick up something new to you – GOK WAN style comes to Dorchester! Proceeds will go to WAND to support other events. Click here to see the Final Programme DWD 2013 (4 March) (subject to minor changes). 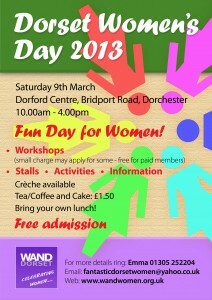 If you would like to have a stall at this event or simply like to learn more about WAND, please get in touch. This entry was posted in Uncategorized on February 19, 2013 by sueb. I am really looking forward to having a good shop ! !